With rainfall general across the Prairies — excessive in certain areas — and with flowering just around the corner, the sclerotinia stem rot risk is building. Assess the situation field by field to see which may warrant a protective fungicide. 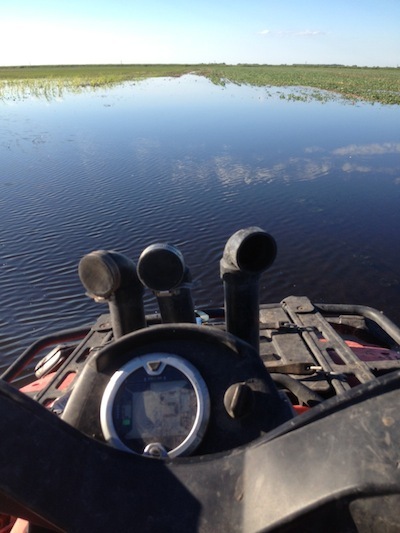 Excessive moisture can cause leaching of nitrogen and sulphur. Assess yield potential and root depth to see whether a top dress application of N and S fertilizer is worthwhile. Monitoring for bertha armyworm moths, diamondback moths, and cabbage seedpod weevil begins. But these aren’t the only insects to watch for. Red turnip beetle, root maggots, lygus and cutworms are out there. “Watching” doesn’t mean “spraying” but scouting is still important to know what’s happening. Many crops are near the 6-leaf stage, which means the weed control window is closing. Aerial is one option if fields are too wet for the sprayer and you need to spray now to stay on label. Another option for perennial weeds that have escaped but are delayed relative to the crop is to wait and use pre- or post-harvest glyphosate — especially if weeds are delayed enough to avoid seed set prior to swathing. What are these arrows pointing at? 1. Have a plan to manage clubroot. Don’t wait until clubroot manages you. Whether you’re a farmer, agronomist, county/municipal staff, extension, or from the oil & gas industry, you need a clubroot management plan. A plan should include answers to the following: How will you quarantine a field? How will you plan your field work? When will you sanitize your equipment? When will you use resistant varieties? Visit www.clubroot.ca for help with your plan. Read more to see the other 9. 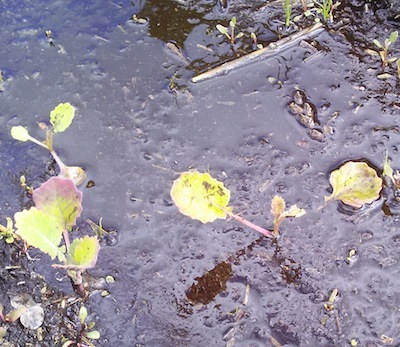 Wet soils cause an oxygen deficiency, which reduces root respiration and growth. Root failure reduces nutrient uptake, and plants will eventually die unless drowned areas dry out quickly. 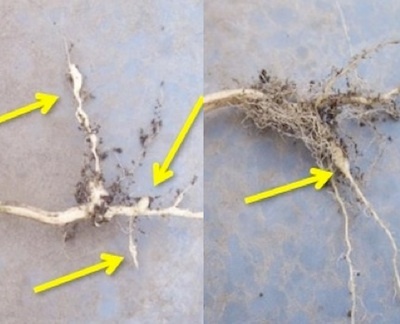 A few days in waterlogged soil can be enough to kill canola plants, and yield loss is certain — although as canola plants age, they tend to be more resilient. Growers can expect to see some nitrogen loss from extended heavy rains, probably in the range of 20-50%. Before top dressing, wait to see how the crop recovers from saturated soils before investing any more in fertilizer. Don’t do anything while soils are still wet — roots cannot take up nutrient when soils are saturated. Applying nutrient direct to leaves doesn’t help. Most foliar-applied nitrogen is washed off and then goes into the root zone. Uptake through the leaves is minimal. 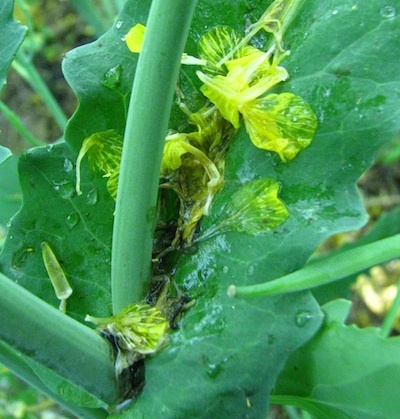 We’ve had reports this week of growers causing unexpected damage to canola because the sprayer was not cleaned properly. The ideal tank cleaner has a detergent, a surfactant and a component to increase pH (i.e. ammonia) in one formulation. The detergent will cut any oils or fats found in current adjuvants, the pH increaser solubilizes the Group 2 herbicides and encourages chemical hydrolysis of some products, and the surfactant makes sure that droplets don’t hang on the sprayer surfaces. Think of the spot free rinse at the car wash. Growers with high risk conditions for sclerotinia stem rot may want to get their management plan in place. Booking fungicide may be worthwhile if you have a preferred product. This is pre-planning only. Fungicide applications must target flowers to be effective, so do not spray until a field reaches at least 20% flowering. The Scott site has been swathed for about a week, as of August 28. Visually, maturity and biomass show no apparent differences among treatments. Plots will likely be harvested by September 3.